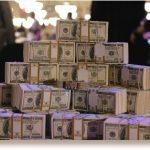 The Millionaire Maker was the story of the day, as players lined up the night before and the morning of the tournament to register. With $1 million guaranteed for the winner and a single reentry allowed per player, the excitement in the Rio was palpable. Ultimately, the Rio was filled to capacity with players. Tables were located in the casino, and the three ballrooms were completely filled, with cash games, satellites, and the daily tournaments on hold until the field could be thinned to a manageable number. While some predicted the field would top 8,000 or more players, it came in just under that estimate, but still made quite a few WSOP staff members very happy. 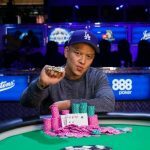 The aftermath is still being sorted this Sunday morning, but in the midst of it all, Tuan Le and Kyle Cartwright claimed WSOP bracelets and will collect them today at the bracelet ceremony. Day 3 brought 12 players back to the tables with WSOP Circuit multi-event champion Kyle Cartwright as the chip leader and former WSOP Main Event final tablist Ylon Schwartz in the top three. Cartwright had an even more substantial lead when the official final table of nine was set, and he took that through 155 hands to victory. 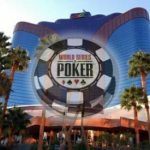 Day 2 reduced the field from 54 players down to only 12, and Day 3 saw some of the biggest names in poker battle for the title. 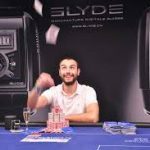 David Benyamine was the first to fall early in the day, followed by Jon Turner, and Jason Mercier fell short in ninth place. Justin Bonomo was strong throughout the final table, while 2013 2-7 Triple Draw champion Eli Elezra exited in third place. 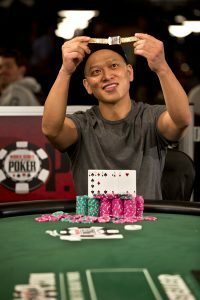 Bonomo took a slight lead into heads-up play against Tuan Le, but the latter was a strong force and earned a hard-fought victory. Day 2 hosted those 120 players who won their tables, all of whom were guaranteed at least $4,411 at that time. And the tables played out over the course of a very long Saturday. In the end, only 12 players remained with Josh Arieh and Jared Jaffee among the finalists. Events 6 and 7 will play to the final table and for the win. Event 8 will thin the still-massive field and attempt to come close to a final table. Event 9 ($1,000 NLHE) will begin at noon, and Event 10 ($10,000 Limit Omaha Hi-Low Split-8) will kick off at 4pm.